Over the next few months, I will be writing about each of the individual albums in the Otis Redding Definitive Studio Albums box set. It would be far too daunting a task to try to summarize so many great albums into one review for the entire set. Otis Redding is one of my favorites and each album deserves to be savored. 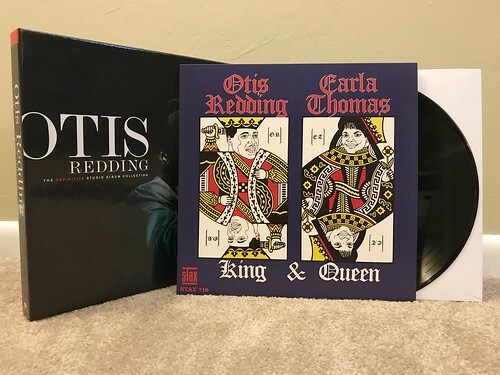 King & Queen is a unique entry in the Otis Redding catalog as it's a joint effort with the equally great Carla Thomas. They have an undeniable chemistry together and in a lot of ways they bring out the very best in each other. It's particularly interesting to watch Otis have someone to play off of. There are times where they just trade vocals back and forth, but then there are times where they come together in a way that's every bit as dynamic as the best Sam & Dave songs. Most people are likely familiar with the hit from this album, "Tramp." For good reason, it's a completely killer song that rank among the best either Carla or Otis ever released. But this album has so many other wonderful moments, the highlight for me being their take on the Eddie Floyd classic, "Knock On Wood." That's a song that's so amazing and so engrained in the musical history of this country that many soul artists in the 60s took a stab at it. Otis & Carla's stands out as unique, turning it into a dueling vocal masterpiece. Neither trying to outdo the other, they work in harmony to take an incredible song and somehow elevate it even higher. It's become repetitive for me to say, but Otis Redding was such a unique artist who churned out an incredible amount of stone cold classics in a relatively short period of time. There's a reason these songs have endured as long as they have. I'm just happy to have a nice box set that compiles a great many of them.